Glancing down the list to the left of this screen recently, I was surprised to note how few of our Transatlantic cousins are represented there. For if you forget about (and I have certainly tried to) the American bands I saw at Knebworth, then this Meat Loaf gig and the earlier Blondie one were pretty much it by mid 1982. And I would not even had gone along to this one, had Wife not wished to attend. When we were married the previous year, she brought to the matrimonial home a small but eclectic LP collection. (For the record, my most substantial contribution to the new household was my overdraft). Amongst her collection was her prized copy of Meat Loaf’s Bat Out Of Hell. I listened to it a few times and, as a Progger, I could appreciate the lyrical dexterity and the musical complexity of the title track, but most of the rest of it left me cold; particularly the cringeworthy Two Out of Three Ain’t Bad. The one song I really did enjoy was the mini rock-operetta Paradise By The Dashboard Light, which I felt displayed a rather deft wit. Something not often found in American Rock ‘n’ Roll, in my experience. This tour was to promote The Big Man’s second album: Dead Ringer – the title track of which had been a sizeable hit in the UK a few months previous. Mr. Loaf began the set by bravely playing his trump card first : Bat Out Of Hell. His band, Neverland Express, crashed through the Wagnerian intro, before he ambled onstage clutching his obligatory silk handkerchief. I recall it being a pretty impressive rendition of the song I have to say, Meatloaf recreating his eyeball bulging, temple-vein pulsing vocal gymnastics from the vinyl recording with ease. Thereafter, for me anyway, it was a case of politely sitting through an hour or so of Jim Steinman’s rather overly melodramatic compositions, waiting for The Dashboard Light to flicker on - which it did, towards the end of the set. Meat Loaf and vocalist Pamela Moore (who was performing Ellen Foley’s studio part on this tour) rattled through the thing word for word before drifting into ad lib during the third section. At the height of the couple’s argument, Meat Loaf shoved his face right into Moore’s and whispered “Watch my lips”, before bellowing “Fuuuuuuuuuuuuuuuuuuuuuuck Offfffffffffffffffffffffffffffff !!!!!!!!”. It's not terribly often one gets to hear the F word at 140 decibels, I thought. The only other memorable incident from the gig occurred I think during the encore (Chuck Berry's Promised Land? ), when the two lead guitarists and the bass guitarist lined up to riff away rather in the manner Status Quo used to (indeed, probably still do). 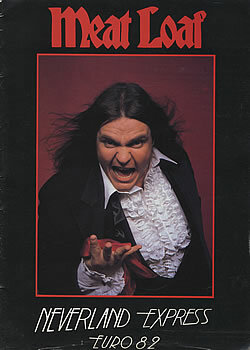 Meat Loaf picked up a guitar from somewhere and joined them………as did the back-up singers, then the keyboard player, and finally what looked like all the roadies and stage crew. Eventually there was a line of over a dozen folks sawing away together. All very silly, but delightfully so. At the end I had to admit the show had been surprisingly entertaining. Very slick and very professional with a welcome dollop of humour, but all-in-all perhaps not quite my cup of root beer.